Tenderness. Kindness. Gentleness. Rare commodities in such a brutal world. These are delicate flowers that are trampled too easily by the world’s rough elements. I hope my children learn and treasure tenderness, gentleness and kindness. I hope they realize these qualities are ever present and like Shakespeare’s quality of mercy – The quality of mercy is not strained. It droppeth as the gentle rain from heaven upon the place beneath. It is twice blest: It blesseth him that gives and him that takes – they are always appreciated by the receiver, and they bless the possessor. I remember an incident when I had taken one of the little ones to 7-11 for a snack. I was really irritated with her. I don’t remember what she did, but I remember being short with her. I told her to hurry up and get what she wanted, and let’s get out of here. She sensed my displeasure, and quickly ran to get what she wanted. I could tell she was hurt by my shortness. Tough…huh? I was in my doormat martyr mood, and I was giving her the silent treatment. As I waited for her, John Mayer’s song, Daughters, came on the radio. As I listened to the song and watched my little girl run around getting her snacks, my heart softened. I am sure I had to suppress a tear or two. She’s just a little girl who’s been through a lot of crap. I could try a little harder to be a little nicer; even when I had to be firm or had to say no to something, I could do it with some tenderness. One of the reasons I enjoyed having pets – we had a lot of pets – is that my kids learned to be around creatures that were weaker than them. Just like standing next the ocean teaches you humility, having pets teaches you not only responsibility, but also gentleness and tenderness. 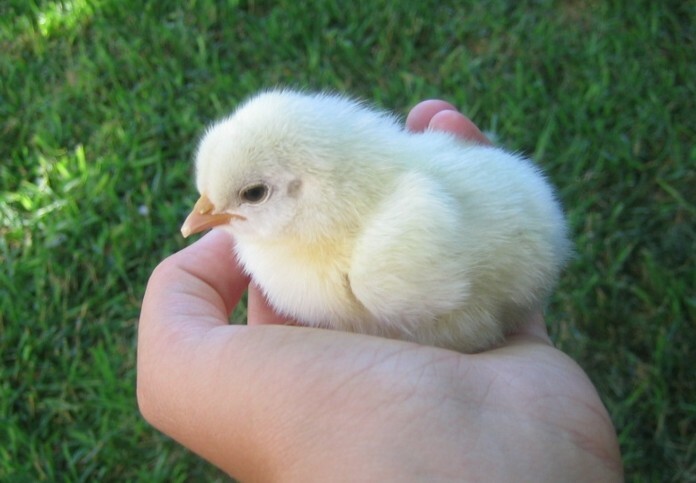 You have to be careful and gentle around a baby chick. We live in a world that is reckless, heartless and insensitive to people. I tried to create a little world where they could learn tenderness by holding a newborn puppy or by caring for a terminally-ill dog. I know they will probably hurt more than others because of this sensitivity, but they will also empathize with other folks who are in pain. I hope that their hearts will remain sensitive and compassionate not only toward the people they meet along their journey, but all of God’s creatures.